In his interactions with cardinals, journalists and with all people in general, Pope Francis has stated that he wants a “poor church, for the poor”. He has reminded us that true power means service, and that service implies the protection of the most vulnerable in our world. In his role as the Vicar of Christ, the Pope is called to care for Christ’s flock. Jesus called St. Peter, the first Pope, to feed and tend his sheep (John 21:16-17). In turn, the Pope is called to be both a teacher and a shepherd. He teaches and leads not merely with well-written homilies or off-the-script comments, but with his actions. After all, it was St. Francis who said, “Preach the Gospel at all times, and only when necessary use words.” The Pope is preaching the Gospel with his life. He is doing it just as he has done it for many years. In being a Gospel-bearer, he has gone beyond proclaiming the Good News. He has become good news; he has become a source of glad tidings. He has learned to glorify the Lord by his life. And we rejoice in it. As we reflect on the election of Pope Francis, our call is to discern what it means for us. As we rejoice in the election of this Jesuit priest from Argentina as our Pontiff, we ought to consider what the Holy Spirit is telling us all. As we delight in the great simplicity of El Papa, we are called to embrace that simplicity. In a world that treasures wealth, possessions and fame, we are called to live simply and to be humble. As we celebrate a Pope whose heart is so close to the poor and the marginalized, we are called to open our hearts to those who are suffering and who are longing for healing. As we thank God for this joyful man who calls us to be remember the real meaning of power, we are empowered to serve those in need. We cannot praise the Holy Father for all the wonderful things he does and says, when we continue chasing after titles, property and esteem. We are being called to re-assess our lifestyles and to put our gifts, our time and our resources at the service of the most vulnerable and marginalized. It might help to ask, do I know the poor? Do I spend time with them? Am I able to be vulnerable around them and invite them into our lives? The more we allow the poor to crash through our defences, the more unsettled we feel. We begin to feel that the poor are just like us. We begin to identify with them and learn to lay down the burden of our perceived superiority. We are humbled and called into building a relationship. It is worth rethinking our closeness to the poor. 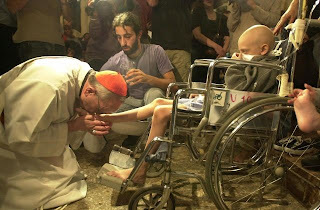 A good and holy monk once asked me, “So, you say you love the poor? Well, what are their names?” At that time, I did not have a good answer. The poor were merely an abstract conception; a blurred face I passed in the street; a nameless face I once saw in a World Mission commercial. I wanted to change that. The good thing is that it is never too late to do something about it. When we speak of the poor, we should never idealize them or simply think of them in the abstract. The Pope is inviting us to transform the world by entering into relationship with all humans, but especially with those on the margins of society: the poor, the alienated and the infirm. Let us accept this invitation. In tending to the needs of those in need, we will be transformed and in turn will become agents of transformation in the world. In healing a broken world, we will be healed. This world is in need of love, healing, justice, beauty and truth. Pope Francis cannot do it all alone. We are invited to become messengers of the Good News and in the process to become good tidings for the world. The medium is the message. The message is the Crucified and Risen Lord. Will you become the medium, a channel of his peace? Te la comiste! Thank you. I am not sure how I feel about the invitation to befriend the poor. Honestly, they kinda freak me out. I get scared when they close or ask for money. I can't even look into their eyes. So what will people do in response to the new Pope's humble but still symbolic gestures. Probably not much. Perhaps a few days volunteer work in a soup kitchen or a tad more in donations to Catholic Charities. What did the people do to Jesus when he ate and drank with the poor and washed the disciples feet? They killed him. Thank you for the post and message. A wonderful reflection. The phrase is slightly different, though; "The medium is the massage" is the correct phrase. It is often misquoted. Your understanding is correct. The mistaken phraseology has a far different meaning than is intended. The "message" implies an overtaking of the topic by the form of communication instead of an influence. Again, a common mistake but one that holds grave consequences. "Message" could be an interesting study but, in this case, does not apply, instead it would implicitly point to a cult of personality overshadowing the Truth of the Pope's message. anamaria81, it's not bad; it's honest. That's really important, so thank you for your honesty. I wonder if you can go a little further. What is it that freaks you out? Is it that person or is it your own reaction to that person? What would happen if you took a chance to talk to someone? Even if you have to bring a friend along with you to make you more comfortable, it might be a worthwhile experience for you. I'm also sometimes uncomfortable when people ask for money. But I don't think it has anything to do with that person - other than the fact that he or she serves as a reminder of my privilege in this very unequal and often unforgiving world. Ana Maria and Emily, it is a good think to examine how we feel when we approach the poor. I think Emily's questions are very good. I think the key for many of my own encounters is vulnerability. I allow myself to become vulnerable before the homeless, the poor. It allows them to be themselves. It is also important to know yourself and know your limits. If you do not feel like you can do this on your own, start volunteering in a soup kitchen or participate in God's squad or something of the sort. I do not give money to homeless people. If they are hungry, I will buy them food or point them to a place where they can get help. Most people want the money. I think what is more important than the money is that we stop for a moment and we look them in the eye. That we take a moment to notice them. Most homeless people in our cities are devoid of real human contact. I usually ask the same three questions: What is your name? Do you have a place to sleep? Where are you from? Those questions always lead to interesting conversations. Give yourself the time to talk to them. Maybe that is the best way you can be with the poor. We are always in a rush. We always have things to do. Places to go. Stop for a moment and just be with them. Shane, I think if we really take the time to ponder the message, we are safe from entering into a cult of personality of the Pope. Thanks for commenting. "Shane, I think if we really take the time to ponder the message, we are safe from entering into a cult of personality of the Pope." McCluhan's aphorism 'the medium is the message' profoundly grasped "all is gift" that we can find the transcendent in all things, even suffering. His insight is IMHO better expressed as mirror image: any message (illumination) imbues itself in the medium (the silver tinted glass, then the rods and cones of your eyes) receiving the reflected light that illumines all things under the sun. was acquainted with McCluhan both sharing a fascination with Chinese traditional ideographic poetry, e.g. ".. American mind is not even close to being amenable to the ideogram principle as yet. The reason is simply this. America is 100% 18th Century. The 18th century had chucked out the principle of metaphor and analogy — the basic fact that as A is to B so is C to D. AB:CD. It can see AB relations. But relations in four terms are still verboten. This amounts to deep occultation of nearly all human thought for the U.S.A. "
"In the language of the schoolmen, for whose precision of dissociation Mr. Pound has so frequently expressed his admiration, the ideogram represents the "copula of agglutination." That is to say, the copula of existential reality and not the copula which connections, ennunciations, and conceptions in rationalistic discourse. And it is the consequent solidity and sharpness of particularized actuality.."
KArol Wojtyla would reconize "copula of agglutination" as his theology of the body - that the perichoresis of the divine pervades beauty goodness and truth in mysterious fashion, for God fashions it all, he is God! The remedy the West's affliction with affluenza?